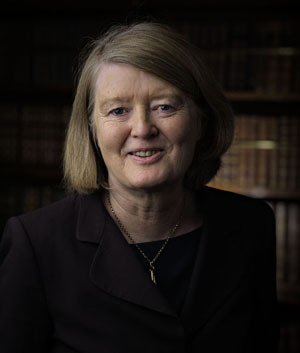 Mary E. Daly is the current President of the Royal Irish Academy. Professor Daly was elected in 2014 and made history by becoming the first female president in the 230 year history of the Academy. Professor Daly is Emeritus Professor of History at University College Dublin (UCD) and served for seven years as Principal of UCD College of Arts and Celtic Studies; she has also held visiting positions at Harvard and Boston College. From 2000 to 2004 she was Secretary of the Royal Irish Academy and vice-chair of the Academyâs Working Group on Higher Education. Over the course of her distinguished career, Professor Daly has researched widely and published prolifically, notably: Dublin, the Deposed Capital: A Social and Economic History, 1860-1914 (1984); Women and Work in Ireland (1997); The Slow Failure: Population Decline and Independent Ireland, 1920-1973 (2006); and, with Theo Hoppen, Gladstone: Ireland and Beyond (2011). She has edited the Royal Irish Academy publications 1916 in 1966: Commemorating the Easter Rising (2007) and Roger Casement in Irish and World History (2005).